Adrian Sarchet is an Advocate from Guernsey is a busy man on dryland and in the open water. Over the last several years, the 41-year-old has completed crossings of the English Channel (2012), Catalina Channel (2013), Strait of Gibraltar (2014), North Channel (2015), and Molokai Channel (2016). Daily News of Open Water Swimming: How do you start your daily workouts in the pool? Adrian Sarchet: On automatic pilot. Because I work long hours, I have to cram training in at the beginning and the end of the day. I usually wake up about 800 metres into the early morning session wondering how I got to the pool. Daily News of Open Water Swimming: How do you start in the open water? Adrian Sarchet: I only usually get to swim in the open water at weekends - so it is a real treat. As a result, I tend to lose the plot for the first kilometre or so and get lost in that glorious sensory overload. Daily News of Open Water Swimming: Do you jump in the water or dive in? Do you slowly sit at the edge of the pool and ease your body in the water or do you take a running dive? Adrian Sarchet: DIVE. STRAIGHT. IN. See my answer above - I’m to excited to do anything else. Daily News of Open Water Swimming: When you hit the water, what are the first things that you think about? Is your first impression about the water temperature or is it how your body feels? Adrian Sarchet: The feel of the water on my skin. I tend to get sensory overload for a while and just exist in the moment. Daily News of Open Water Swimming: Does getting in and starting an open water practice or pool workout get easier or quicker as you get older? Or is your typical regimen always the same? Adrian Sarchet: It gets easier and quicker as I get older. I was too easily distracted as a youngster. Age has brought discipline. Daily News of Open Water Swimming: How long does it take for you to warm-up and be able to swim at a good/fast pace? Does a good warm-up differ in your pool workouts versus your practice swims in the open water? Adrian Sarchet: Warm-ups take less time in the pool than in the open water. In the pool, I’m ready to up the pace after a warm-up of 800 metres or so. In the open water, it is probably more like 1,500 metres. Daily News of Open Water Swimming: If you swim in the ocean, approximately how long does it take for you on average (in minutes) to take off your clothes, put on your goggles, assess the water conditions (and/or currents and tides) and stretch/hydrate before you start to enter the water? Adrian Sarchet: About 2 minutes. There is a glorious group dynamic when a bunch of like-minded lunatics are standing on a beach on a cold, rainy day waiting to see who will be the first to strip off. Once the first intrepid soul begins to strip off, there is then a flurry of perfectly timed activity so that everyone finishes changing at the same time and can all walk or run down to the water's edge. Inevitably, there is always one person who gets their timing wrong, and finds themselves on the end of catcalls and friendly jeers. Daily News of Open Water Swimming: Do you typically eat anything before you start a morning workout in the pool or in the open water? 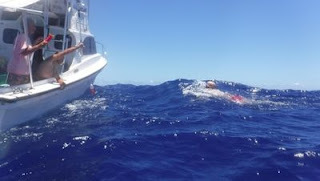 Daily News of Open Water Swimming: When do you determine your swim distance or direction during an open water workout? Do you plan everything well before you arrive at the beach or lake - or do you make adjustments when you get to the shoreline or after you get in the water? Adrian Sarchet: We plan the swim on the shoreline before we change. Daily News of Open Water Swimming: What are your perfect conditions for a practice swim? Daily News of Open Water Swimming: What kinds of days or conditions do you dread getting into the water? Adrian Sarchet: I never dread getting into the water. The rest of my life is so frantically chaotic and time-pressured that my time in the water is the ultimate relief, whatever the conditions.